The Center for Judaic, Holocaust and Peace Studies invites the public to a presentation by Rwandan Genocide survivor Eugenie Mukeshimana. Her talk will begin at 3:15 p.m. on Wednesday, July 25, at Grandfather Mountain Ballroom, Room 137, in Plemmons Student Union (263 Locust Street, ASU campus). Music was a key tool in the perpetration of many modern genocides. 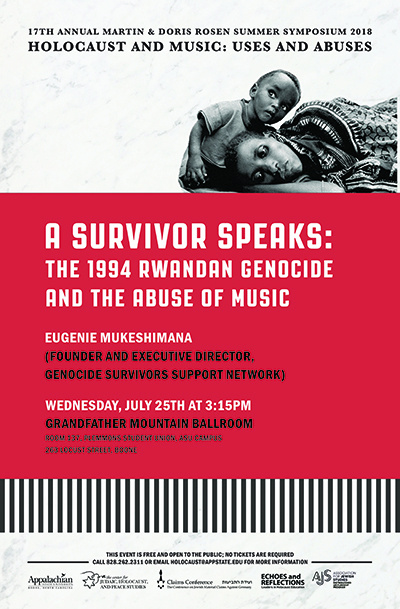 Eugenie Mukeshimana’s talk will combine reflections on how Hutu Power proponents and genocidaires employed music in the slaughter of mostly Tutsi Rwandans with testimony of her own struggles to survive this genocide. Ms. Eugenie Mukeshimana is the founder and executive director of the Genocide Survivors Support Network (GSSN), a New Jersey-based charitable organization that helps genocide survivors rebuild their lives. A native of Rwanda, she is a survivor of the central African country’s 1994 genocide. While in hiding from the Hutu genocidaires, who killed about 800,000 of her countrywomen and –men, she gave birth to a daughter. Widowed in the genocide, Eugenie Mukeshimana came to the U.S. in 2001 to pursue a college degree in social work in Albany, New York. After graduating, she worked with homeless families, helping them to regain housing stability. In 2010, Ms. Mukeshimana founded GSSN, which has helped survivors to access critical services such as immigration assistance, mental health treatment, language and cultural orientation, career development, and college enrollment. It has also enabled many to share their stories with thousands of students throughout the country. In recognition of her work, Ms. Mukeshimana has, among other distinctions, received a fellowship from Columbia University’s Human Rights Advocates Program in 2012. The presentation is part of the 17th Annual Martin and Doris Rosen Summer Symposium on Remembering the Holocaust that takes place from July 21 until 26, 2018, at Appalachian State University's Plemmons Student Union and the Broyhill Music Center. This year's symposium puts a particular emphasis on the role of music and its uses and abuses during this genocide. The event is organized by Appalachian's Center for Judaic, Holocaust, and Peace Studies and named for symposium benefactors, the late Doris and Martin Rosen. For the symposium's complete schedule, see https://holocaust.appstate.edu/symposium/2018-schedule. For more information, call 001.828.262.2311 or email holocaust@appstate.edu.